25 cm 32 p. : col. ill.
Kelly and Kai love to play on the gnarled old tree trunk outside their cottage in the woods: sometimes it becomes a horse, sometimes a crocodile and sometimes even a dragon. One day a mischievous gnome makes the tree trunk come to life, and the children are whisked off to the Land of Long Ago on the back of the old tree dragon. On their incredible journey Kelly and Kai meet a princess, rescue a knight and trick the king of the trolls. 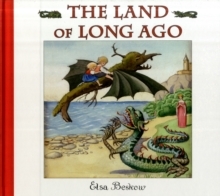 But will the old tree dragon stay alive long enough to bring them home again?A delightful fairy tale from Elsa Beskow, with beautiful illustrations in her unique, classic style.